One of our all time heroes The Rammellzee died last week. Rammellzee was one of the coolest guys of New York’s late 70ies and 80ies street art scene. He was a pioneer of Graffiti in the streets of New York and also one of the first dudes in Hip Hop culture. He wasn’t stuck in cliches as so many others in the Hip Hop world. No: Rammellzee always was interested in creating new things. So he brought spray art into a new level. Yes: He created his own world: Gothic Futurism. Consisting of crazy crazy muppets. Robots. Spaceships. An own language. Yes, a whole universe. For more then 30 years he just worked on this idea. In 2002 Mathias and Jonas (Munk & Telonius) – our Gomma bosses met him in New York. He was looking for somebody who was young and would produce a soundtrack for his Gothic Futurism world. 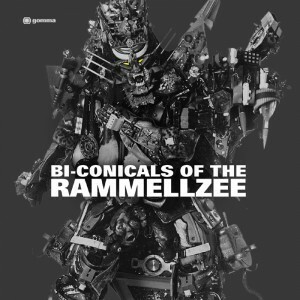 For over one year they worked on the 12 songs that late came out as “The Bi-conicals of The Rammellzee”. Stuart Argabright from Death Comet Crew, Tim Sweeney and others helped to create this crazy album. Gomma is very sad. A great inspiration left the world. The Rammellzee R.I.P. …you were great, man! Also here are 2 songs from the album. THE RAMMELLZEE is a NYC – Icon. Something like the “Godfather of street art”! Known as one of the originators and still leading figure of contemporary underground art, street culture, Graffiti and Electro/ Hip Hop (his BEAT BOP single with Jean Michel Basquiat and K – Rob is one of the most important original rap tracks ever – reissued this year on MoWax and Soul Jazz). He was featured in all important Hip Hop films of the 80ies (“Wildstyle”…) and worked with people like Fab 5 Freddie, Michael Holman, Futura 2000, Phase 2 and was (with his partner Basquiat) one of the first graffiti artists accepted by the “official” art world. Over the last few years he got quite a heavy reputation – especially in Japan and in the US street art scene – for developing his own special universe („Gothic Futurism“). It consists of big human size fantasy muppets (walk-ins), the LETTERRACERS (figurative skateboards) and also the original collage paintings he had invented back in the 80ies. But this is not a comeback! The Rammellzee has been already doing lots of new stuff recently including styling NYC’s SUPREME skate/ fashion company’s shops worldwide in 2003, doing new exibitions and performing several concerts in Japan with (Japan’s Nr. 1 Hip Hop – DJ) DJ Kensei and NYC’s Death Comet Crew. Japnese leading mag RELAX and UK’s DAZED & CONFUSED recently came out with some big (cover) storys about him. After the 2003 No Wave/ Punkfunk/ NYC – revival – wich Gomma preceeded with it’s 2000’ ANTI NY compilation – the Rammellzee’s album could be a next level. A futuristic development of the original No Wave and Post Punk attitude – the angry, superenergetic NYC rawness versus an international new school of electronic producers…this is not a revival of 20 years old music! This is NOW – sound! We feel it fits perfect into 2004. ARTWORK: THE RAMMELLZEE. Guest appearances by NYC – rappers K – ROB & Shockdell. 1) Do We Have To Show A Resume? Lots of people call The Rammellzee „the godfather of street-art“. Having started his career back in NYC in the late 70ies as a kid, he was featured in many of the famous Graffiti & Street art films of the Hip Hop period („Wildstyle“). Later he had appeariances in films by Jim Jarmusch and Schnabel’s „Basquiat“ movie. 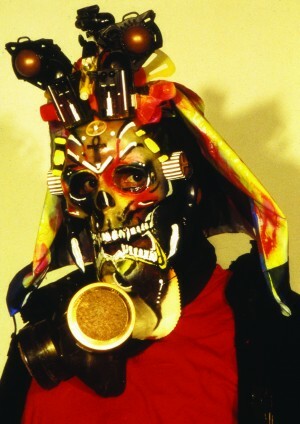 In fact the Rammellzee was part of the original NYC – underground art bunch around Jean – Michel Basquiat, Phase 2 etc. But he did not disappear. In the 90ies he went on developing his own special unverse called „Gothic Futurism“ (check: WWW. Gothic-Futurism.com) inventing absurd skateboard – figures („letterracers“) and crazy muppets. Pay The Rent features legendary NYC rapper Shockdell. The flipside Beatbop Part 2 (incl. NYC-rapper K–ROB) is the followup single to Beat Bop Part 1, a track that the Rammellzee did with K–ROB and Jean Michel Basquiat back in the 80ies and that has been called by many Hip Hop heads „one of the most important rap tracks ever”. 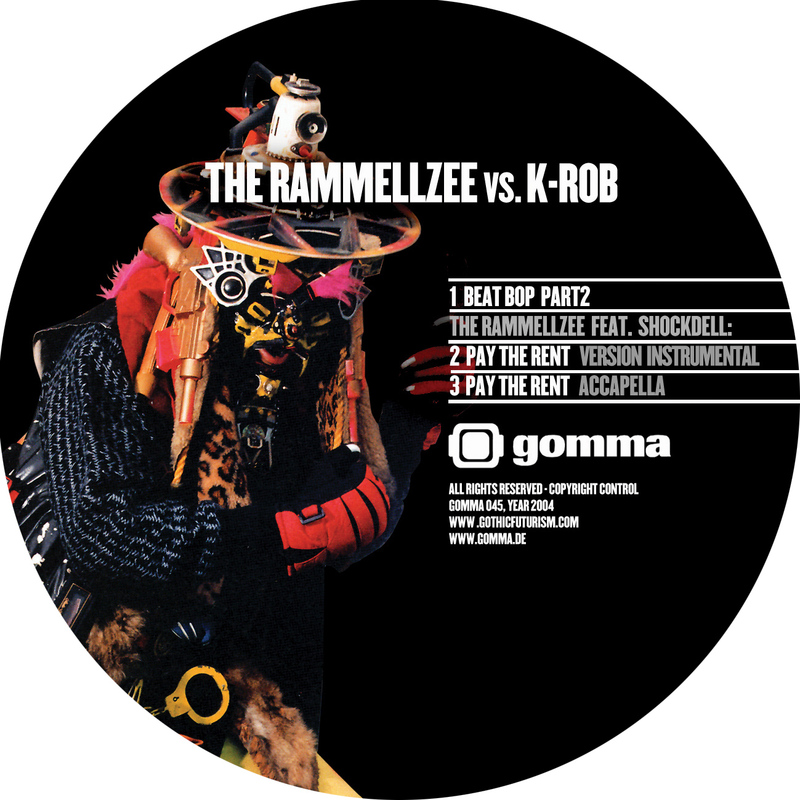 The Rammellzee got in contact with Munich’s Munk some time ago (he is a friend of some friends of Munk in NYC) and asked them to do this special single. (Munk had rereleased an old track by him on their 2000’ ANTI NY – NY – No Wave – compilation). He did not want an usual Hip Hop producer to do the tracks, but somebody that comes from a more progressive scene. So they met in NYC a few times and did these angry „speachees“. More stuff coming up in 2004! Artwork on this 7” by The Rammellzee!